He awaits your next move. Compelling statue from the Captain Harlock manga series! It features the space pirate in his chair aboard the Arcadia. Glorious color and outstanding detail. An ideal gift for the manga enthusiast in your life! 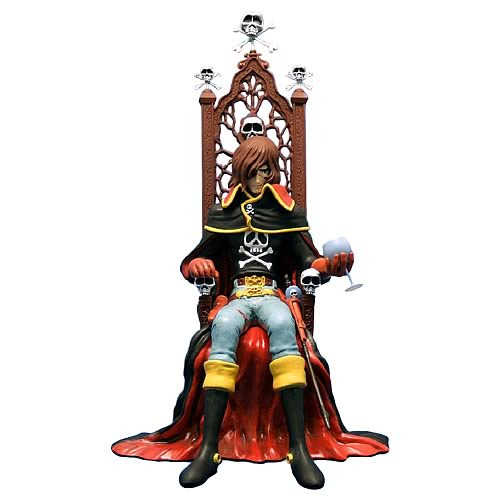 Spotlighting an icon of the Captain Harlock manga series, this compelling statue features Harlock in his spaceship, the Arcadia. This infamous chair is where he issues orders, relaxes, or contemplates his next move with a glass of wine in hand. The individualistic space pirate appears here in glorious color and outstanding detail. He's awaiting your next move. What will it be? Statue stands 10-inches tall.